Racial Justice Rising grew from many roots. 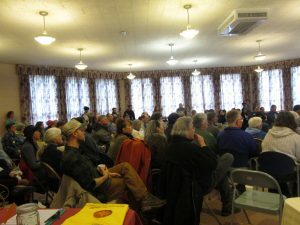 People’s Institute for Survival and Beyond: Several of our original members were part of a white anti-racism group that formed after an Undoing Racism Workshop. In 2004, three members of a white anti-racism group decided to write an apology for slavery. 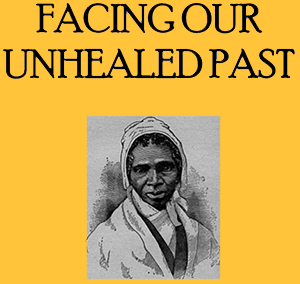 Working closely with UMass anthropology professor Dr. Enoch Page, we researched and wrote “Facing Our Unhealed Past,” completing it at the end of 2008. We chose the name “Mass Slavery Apology” because of its double meaning: acknowledging our location in Massachusetts and also hoping to inspire a mass movement to redress the legacy of slavery. In early 2009 we printed copies of the statement and put up a website. We began to define ourselves as reaching out primarily to others of European descent in order to broaden white communities’ understanding of racism, white privilege, and racial justice. An important part of our outreach was engaging other whites to sign the apology statement. White group members worked closely with advisers of color. Our activities over the next few years included our email newsletter, presentations to students and other groups, speaking about our work on local radio shows and at other groups’ events, and a series of four workshops based on films. In January 2014 we began a series of free monthly programs as a way of further reaching out in our local community. As the group evolved, we realized we needed a name that communicated our commitment to racial justice for all groups. In 2015 we changed our name to “Racial Justice Rising,” while keeping the name Mass Slavery Apology for our original project. Both people of color and people of European descent are active members and participants in our work. Our monthly program series has become a local fixture and we have expanded our mission to include projects that address injustice in our own communities. 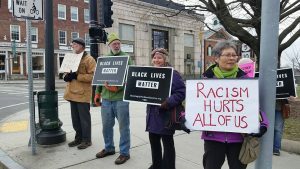 In March 2016, in response to racist acts in our community, we initiated a weekly vigil for racial justice in Greenfield’s town center. We have been helped along the way by many advisers and mentors. Our great thanks to those who have inspired, taught, and guided us in this project, including Ingrid Askew, Dwayne Brewington, Tim Bullock, Sister Clare Carter, Howard Clark, La Wanza Lett-Brewington, Enoch Page, Mustafa, Brother NorthStar Polaris, Kato Shonin, and Tall Oak. View thoughts and feedback from participants and readers, and/or share your thoughts!